Santa Claus didn’t factor heavily into my life growing up. He’s appear on countless holiday specials, and would be sitting in malls waiting for children to sit on his lap to ask for certain Christmas presents. Being Jewish, I didn’t care for the Christmas specials and has no interest in siting on a strange man’s lap. In fact, my feelings towards Santa didn’t end at indifference. On Christmas eve, I would ask my father to light a fire in the fireplace. I wasn’t intending this to be a signal or a warning to Santa Claus, but a trap. I was actually hoping that Santa would somehow forget that we didn’t celebrate Christmas, would come down our chimney, and would get roasted. I don’t want you to get stuck in the chimney so here is my advice: Don’t eat so much not healthy food on Christmas or on any other day. JSL seems to want to help Santa out, not have him burned alive. 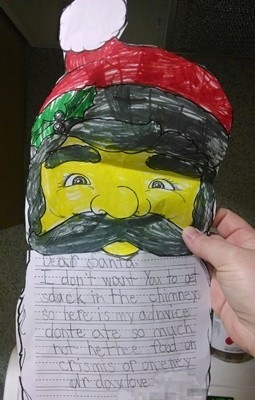 A much different sentiment expressed than the one I had for Santa when I was young.